Some of the best inspiration can come from foraging in your own refrigerator or cupboards or freezer. Leftovers, fresh or pre-cooked, can, with a few tweaks, be the basis of the next day’s breakfast, lunch or dinner. For a variation on the Fork Tacos recipe posted previously, here's a way to use up the remaining items, or, the dish could start out this way, depending upon your choice. Again, this is a dish that you could prepare with your child/ren, having them help count the layers as they are added to total the number 7. It is also a good party dish as it can go a long way and, served in a glass baking dish, it adds lots of color to a spread. The key to this dish as well as the recipe given earlier is the flexibility that they provide, for family dinner, or even for entertaining. Both meals are relatively easy to prepare ahead so that you can enjoy your guests' company without having to constantly be in the kitchen. Serve this with scrambled eggs, and voilà! It is the centerpiece of a hearty Mexican-themed brunch. If doing this variation, softened flour tortillas instead of chips are recommended as accompaniments. You can also create breakfast burritos from the same ingredients. Find a glass baking dish, any size depending upon the number of people you are planning to serve and/or how many leftovers you have. Prepare the meat, beans, cheese, peppers, olives, green onions as indicated above in the Fork Tacos recipe, or pull out the extras that were made for a previous meal. Have tortilla chips on hand for serving. It should be possible to see each of the layers clearly in the bowl when the dish is finished. Prepare the first 3 layers and cover with plastic wrap until closer to serving time. Add the rest of the layers up to the last layer and cover just as you are expecting the first guests to arrive. Just prior to serving, add the last layer. 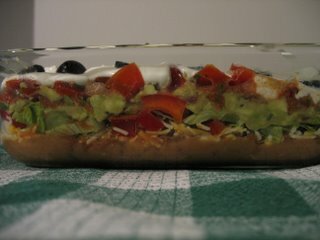 This will keep the warm part warm, the vegetables crisp and crunchy, and the sour cream and guacamole bright and fresh. To serve, take a large serving spoon and cut through the layers so that some of each flavor is put on the plate. Use tortilla chips as utensils to eat dip. Using a non-reactive (i.e., non-metal) bowl, mix together tomatoes, onion, lime juice, spices, and jalapeño. Add cilantro and mix well. Cover and refrigerate for several hours, stirring occasionally to blend flavors. Taste and adjust spices, lime juice, and cilantro to get the balance that suits your palate. Although tempting, extra salt should not be added. It is very easy to over-salt this dish. Tasting the Pico with the aid of a tortilla chip will show why. The salt on the chip will add what is needed. If you’d like some extra kick, add a few drops of Tabasco® sauce. Again, the spiciness will grow stronger as this dish sits. If making guacamole (see below), reserve some of the Pico and the juice that develops prior to adding the Tabasco®. *For those of you trying this recipe outside of the United States, Cilantro = Fresh Coriander. Skin, pit and mash the avocados in a large, non-reactive (i.e., non-metal) bowl. Fold in reserved Pico de Gallo, along with a couple of tsp. of its juice. The mixture should be smooth with some lumps. Adjust seasonings as needed, to suit your tastes. If preferred, you can mash one avocado until creamy and cut the other one into small chunks for a mix of textures or make both creamy. Along the way, others have shown me some of their cooking secrets. Here’s one I’d like to share with you. It isn’t just the leaves of the cilantro that have flavor. Finely chop the stems in addition to the leaves to add extra flavor to dishes that call for this herb. You’ll definitely notice the taste difference! Um. Did somebody forget that the leftover meat also makes a "darn" fine chili dog. No. I just had leftovers of each kind from this luncheon, not just meat. The 7-Layer Dip worked as a way to be able to use up everything. I have to agree with Jon - that leftover taco meat is prime chilli dog material. Although I do love 7-Layer Dip. Choices, choices. Let me know if you like the recipes when you use them. You could do the "creative cooking" angle that some folks (not to be named here) try and put the hotdogs w/ the 7-Layer Dip, but I'm not advocating that!